These water filters are modular systems that allow you to custom order a water filter system for your specific water treatment requirements. All Jumbo filter housings include a white powder coated mounting bracket, ball valves and housing sump spanner. Includes three Jumbo filter housings. Requires standard 20″ x 4.5″ filter OR 10″X4.5″ cartridges. 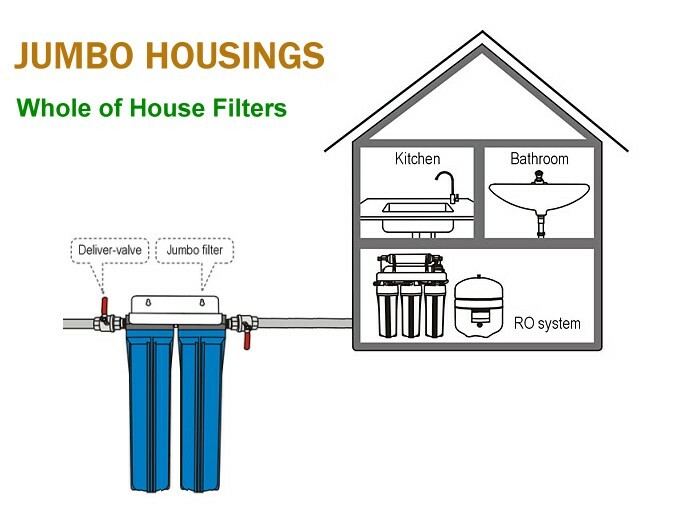 Jumbo filter housings ( 3 stage) remove chlorine and other chemical tastes, odours plus dirt, sediments, making water cleaner, clearer, and safer for your whole house. In addition, they also protect your appliances, fixtures and pipelines. Our jumbo filter housings are usually placed in the main water line entering the home and generally have capacities to filter 10,000 – 100,000 gallons of water before you have to change the cartridge.Heavy duty “Jumbo” housing with pressure relief valve NSF certified materials. Whole House chlorine and chloramine removal: First stage sediment filter and two stages of granular activated carbon or catalytic activated carbon. Bore Water Filtration: First and second stage sediment filter ( depending on silt level) followed by activated carbon filter or activated carbon/KDF media . Rainwater Tank Filtration: Two stages sediment filter ( 20 micron and 5 micron) followed by carbon block filter. Flow rate up to 170 Lpm depending on filter used and water pressure & flow.